Come into our lives, Jesus. Help us to be faithful listeners. Help us to be faithful servants. In all that we do, may we welcome you and serve you as disciples. Amen. Seasons of the Spirit focus Scripture for today is the story of Martha and Mary. A reading from the Gospel of Luke, Chapter 10, verses 38-42. Sometimes we’re called to BE. How does your reading go? And ideas to and fro. M: Mary wasn’t like the other girls in Bethany. She was quite different. A: She looked like the other girls. She had long dark brown hair and smooth olive skin. She had a high sweet voice when she spoke and when she sang. Yes, she looked like the other girls. And she sounded like the other girls. But she didn’t act like them. C: THEY liked to play wedding. Mary wanted to run races with the boys. W: THEY wanted to dance. Mary wanted to climb a tree. G: THEY helped their mothers in the kitchen so they could learn how to cook. But Mary wanted to learn how to read. G/A/C/W: “Read?” said her granny and her aunt and her cousins and the woman who lived next door. A: But Mary wanted to learn how to read. F: Mary began to grow up. M: But still Mary wasn’t like the other young women in Bethany. A: She looked like the other young women. She had long, dark brown hair which she covered now with a scarf. Her olive skin was smooth and her voice when she sang or spoke was high and sweet. C: Yes, she looked like the other young women. And she sounded like the other young women. But she didn’t act like them. Mary wanted to go for long walks. G: THEY stayed at home with their mothers, cooking and sewing. But Mary wanted to read. C: But Mary wanted to read. She wanted to read and study. C: Even though she tried, Mary wasn’t like the other women in the village. She wanted to read and study and learn. Everyone tried to talk to Mary. W: But Mary wanted to read and learn and study. C: Now Mary’s family had a friend named Jesus. One day he was coming to visit them at their home in Bethany. Jesus was a very special friend and they were excited to be seeing him again. A: So Mary sat and talked to Jesus, about wanting to learn to read, about wanting to study, about how nobody understood, about how when she tried to tell people what she wanted to do they would shout at her. G/A/C/W: “Read!” her granny and her aunt and her cousins and the woman who lived next door would shout. W: But Mary wanted to read. She wanted to read and study. M: So she told Jesus all that. ALL: And so she did. Martha and Mary are important to Jesus. Jesus and the disciples are welcomed into their home. In a surprising reversal of societal expectations, Mary does not assume the traditional role of a woman in providing the physical necessities of hospitality. 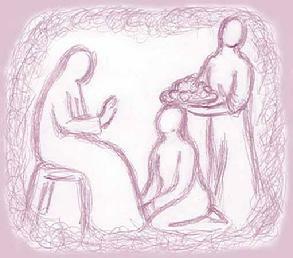 Mary sits at the feet of Jesus; this is the traditional place for the disciples of a teacher – always male in that day. Jesus affirms this reversal and welcomes Mary’s choice to learn from him. To those travelling with Jesus and to the first readers of Luke’s gospel, Jesus’ affirmation of Mary counters the norms of the surrounding society and establishes the expectation that women are to be disciples. It is easy to imagine Martha’s reaction to Mary’s choice. It also is tempting to judge Martha for her choice. However, Jesus’ words to Martha focus on her “worry” about her role. Elsewhere, Jesus warns how worrying can be an obstacle to living in God’s realm (Luke 10:22-31). He said to his disciples, “Therefore I tell you, do not worry about your life, what you will eat, or about your body, what you will wear. 23For life is more than food, and the body more than clothing. 24Consider the ravens: they neither sow nor reap, they have neither storehouse nor barn, and yet God feeds them. Of how much more value are you than the birds! 25And can any of you by worrying add a single hour to your span of life? 26If then you are not able to do so small a thing as that, why do you worry about the rest? 27Consider the lilies, how they grow: they neither toil nor spin; yet I tell you, even Solomon in all his glory was not clothed like one of these. 28But if God so clothes the grass of the field, which is alive today and tomorrow is thrown into the oven, how much more will he clothe you—you of little faith! 29And do not keep striving for what you are to eat and what you are to drink, and do not keep worrying. 30For it is the nations of the world that strive after all these things, and your Father knows that you need them. 31Instead, strive for his kingdom, and these things will be given to you as well. Jesus calls Martha to account for her worrying about the obligations of hospitality, while still honouring the choice she makes. Among scholars, there are different interpretations of Jesus’ comment, “There is need of only one thing.” Is “one thing” a reference to the importance of hearing and responding to the word of God? Or is it suggesting that the food offered might be simpler – one dish instead of many? Through the years, this text has fostered countless misunderstandings among Christians. --Is Jesus diminishing the welcoming hospitality of Martha who is fulfilling an important role in ancient Middle Eastern culture (in another place Jesus chastises Simon for not offering hospitality)? --Is Mary to be commended for breaking a serious boundary and “acting like a male” by sitting at Jesus’ feet, or is it the gospel writer’s intent to commend Mary’s subordinate behaviour? Many women who have found joy in expressing their faith through acts of serving have heard this text as criticism of who they are and what they do. Others have heard it as an admonition to balance contemplation and service – to “do it all.” In pairing this story with The Good Samaritan, the gospel writer proclaims that there is no division between word and work in the life of a disciple. -- The wisdom of trusting in God’s word is described in Psalm 52. The psalmist stresses that those who trust in the steadfast love of God will thrive like olive trees; those who don’t will be uprooted. 4Hear this, you that trample on the needy, and bring to ruin the poor of the land, 9On that day, says the Lord God, I will make the sun go down at noon, and darken the earth in broad daylight. 11The time is surely coming, says the Lord God, when I will send a famine on the land; not a famine of bread, or a thirst for water, but of hearing the words of the Lord. 15He is the image of the invisible God, the firstborn of all creation; 16for in him all things in heaven and on earth were created, things visible and invisible, whether thrones or dominions or rulers or powers—all things have been created through him and for him. 17He himself is before all things, and in him all things hold together. 18He is the head of the body, the church; he is the beginning, the firstborn from the dead, so that he might come to have first place in everything. 19For in him all the fullness of God was pleased to dwell, 20and through him God was pleased to reconcile to himself all things, whether on earth or in heaven, by making peace through the blood of his cross. Today’s readings call disciples to embody a balance of word and work – going and doing, and sitting and listening. Acting in love toward the neighbor is necessary and so is nourishing one’s faith. Life is often filled with activity. Taking a moment for ourselves, spending time in attentive reflection can seem wasteful, decadent, or even a sign of laziness. Reflect on this past week. ---When did you desire/need a moment for yourself? We can draw an unintentional dichotomy between the work of ministry and the spiritual life of faith from this week’s focus story. God of many names, we come before you humbly aware of the many ways we stereotype others and place them into categories. We pray, O God, for all those who have been told “you can’t do that” or “you can’t be that” simply because of who they are. We think of all those caught in moulds of expectation, limited by what we have said they are or shall be. Set us free from this way of living. Inspire all your people to know that you call forth different gifts from each one of us and you empower each of us to manifest and use those gifts to make your world a more wonderful place. Help us, too, not to stereotype or label others, but to let them flourish in the unique and wondrous glory with which you have enhanced all our lives. Encourage us and others to celebrate the gifts others bring, and give us courage to speak against discrimination in all its forms. When people want to put others down simply for being who they are, help us find ways to soften hearts and lift up the specialness of all your people. We pray in Christ’s name. Amen.